When I began cleaning out things after Wife died, one of the big jobs was to sort through all of the holiday decorations accumulated over the decades. There were many things in those boxes. A number of them carried many poignant memories. So, as I looked through those material manifestations of four decades of family life, I sorted them into four piles. One was to keep (quite small), a second was to be sent to Daughter, a third was to Older Son, and the final was to donate. The largest pile was the donation pile. Those were things that didn’t carry many family memories. The second largest was to go to Daughter. She will use some of them and curate the others for Older Son and Young Son as they establish their own traditions and want to include some of the things from their youth. I sent a box to Older Son with things I thought he’d find meaningful. The final bit was for me. That part all fit into a single 30-gallon tub. I have one that is red and green — it’s perfect for me. All the old artificial trees went to local charities. There wasn’t anything in the lot I wanted. So I gave them away. A couple of days ago I decided to get out the Christmas decorations. I wanted to see what I have and decide what to put up. 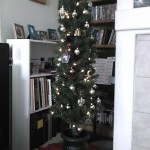 Without a tree, I looked at what Home Depot had to offer in artificial trees. I don’t want a live tree; the Girl might decide to eat it or drink the water. I found something relatively small but big enough to establish a holiday place. I brought it home this morning. Young Son and I set it up, then added some decorations to fill it out. Decorating the tree and putting out a few other things was quite emotional. I knew it would be and wanted to give that energy a chance to vent. Trying to put it aside is not a good idea and is not optional. So, I remembered how Wife loved this time of year… how she loved playing the Santa role. I think it was the high point of her year. Last year was difficult. She wanted to do it all, just as she always had. But she was just starting radiotherapy for her lymphoma and was very ill. She didn’t know it yet, but she was dieing from the disease. She already was showing signs of CNS involvement. But we had a path to travel and so we did all the way through to the bitter end. But, I digress. She did a bit of shopping last year when she felt up to it. That wasn’t much. I finished it up for her when we had a short break from the daily trip to Truckee for her treatment. Mostly she dealt with her illness, her treatment, and rested. That was the right thing for her to be doing. The rest of us handled the other things. 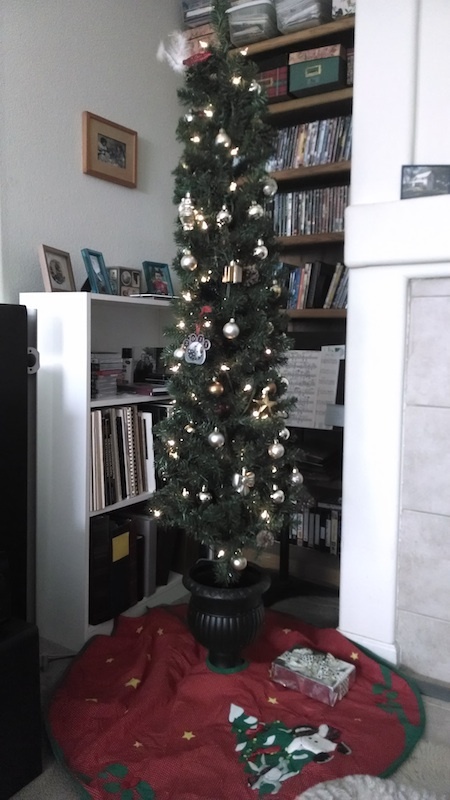 So, it is with substantial emotion that I put up the tree this year. It won’t be the same without Wife. It can’t be. Life isn’t the same without Wife. But, life goes on and so must I. I will celebrate Wife and her love for the holiday. I raise my glass to her when I have a bit of whiskey or a cup of coffee. I salute her life and her fight. Old Girl, we put up the tree for you… and for us. It’s our way of remembering your legacy as well as the reason for celebrating the season. We miss you and it will be different. But we’ll do this for each other and for you.